Day: Thursday, September 14, 2017 NOTE: this event has already happened, find current-year events on the events page. This was our first NDEW event, and only our second meeting for our new club. We launched Bayou Electric Vehicles in southern Louisiana just a few months ago. 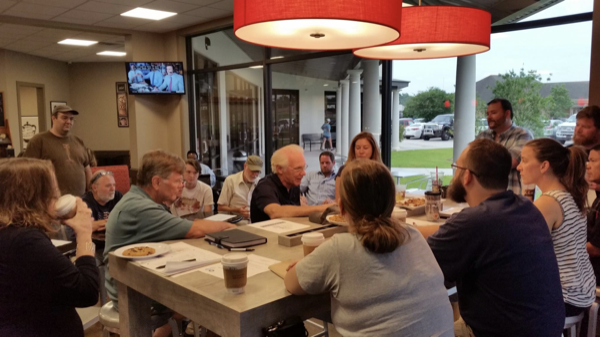 Since then, we've connected with a number of EV owners in the region, and even helped get an EV ordinance passed in Lafayette Parish. We currently do not have any public EV charge station, but because we're at the intersection of I-10 and I-49, our region is poised to close an important transportation corridor infrastructure gap. Come join Acadiana's only electric vehicle club, Bayou Electric Vehicles, for National Drive Electric Week. We'll be discussing recent EV news and make plans to improve the region.